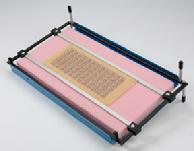 Maximum board size 19.6" x 9"
The low profile design permits fast, comfortable loading and soldering of PC boards. The spring loaded rails provide a firm grip on each board. Once adjusted, board changing is fast. Adjustable legs allows the steel frame to be changed from a 1" low profile position to a 3" high sloping position. The legs are skid resistant. The cover is adjustable for component tension. Upon completion of component stuffing, the entire holder is flipped over for cutting and soldering. It rests on four non-skid bumpers. 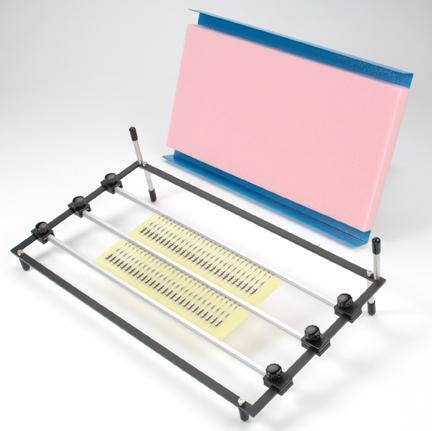 This low profile circuit board holder has adjustable legs that allow the steel frame to be changed from 1" low profile position to 3" high sloping position for both soldering and component stuffing.